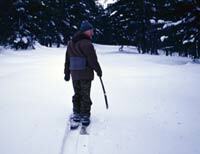 A different way of skiing or be a Trapper! Home → Baikal → East Coast → Khamar Daban → Baikalskij Reserve → Winter special! In school we were taught to think of Russia as a country where everything is as big as it can be. That this is true even for a thing as common as a set of ski, we learned on a day in January. We had to cancel our planned hike to the mountains of Khamar Daban due to the waist-deep snow and were eager to find some other action for the coming day. Fortunately, last year the reservation management in Tanchoi bought 10 sets of original Siberian ski made of wood. With a width of 15 cm and fur that covers the bottom, these skies are just perfect for walking a snowy trail. The skies are equipped with a simple binding made of a leather or cloth string so that you don't need special shoes. Just make sure your own shoes are big enough for the bindings which are rather large. Alternatively, you can rent felt-lined boots together with the skies. You will also get a long stick and thus you are well-equipped for your hike. Naturally, we didn't look very elegant and the skies were clearly not made for racing down pistes or running along loipes. It looked more like a rolling gait interrupted sometimes by a struggle with the binding, but definitely an improvement when it came to going uphill  thanks to the fur at the bottom there was no chance of sliding backwards. At first, we felt a bit odd, skiing with only one stick. Luckily, it didn't take long till Nikolai Nikoleiyevitch, the ranger who accompanied us, informed us that the stick is only helpful for keeping balance or for shaking the snow off the trees in front of you and is otherwise just carried in your right hand. On our way, we discovered several tracks of animals like those of a fox, rabbit, squirrel, and even a sable. They were all explained to us and marked for a new count. Altogether, we very much enjoyed tramping through the snowy Taiga at such a wonderful day and a comfortable temperature of only  8 ° C.
For further information on the Chamar Daban Mountains and the ski centre in Baikalsk please see Lake Baikal/East/Chamar Daban or contact Marita Sutula.